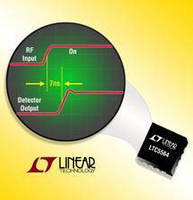 RF Power Detector IC integrates fast comparator. Supplied in 3 x 3 mm QFN package, temperature-compensated LTC5564 operates from 600 MHz to 15 GHz and offers 7 nsec response time from pulsed RF signal. On-chip fast comparator has 9 nsec propagation delay, and user-settable threshold voltage enables flexible trip point. Able to measure RF input signals over -24 to +16 dBm range, device also supports latching output. Output amplifier is bandwidth-capable of demodulating envelope of RF modulated signal up to 75 MHz. MILPITAS, CA - Linear Technology introduces the LTC5564, a precision RF power detector that operates from 600MHz to 15GHz, with exceptionally fast response time of 7ns from a pulsed RF signal. Moreover, the device has an on-chip fast comparator with a propagation delay of 9ns. The comparator threshold voltage is user-settable, enabling a flexible trip point. The device's output may be latched by asserting a latch-enable pin, permitting a fast capture of a short-duration, single-event signal or a fault condition. Its best-in-class performance enables unprecedented speed in timing measurements, rapid response to fault detection and RF power measurements in microwave systems. The LTC5564 can measure RF input signals from -24dBm to +16dBm. This dynamic range is provided by a programmable gain output amplifier with four gain settings, which are digitally controlled by two logic input pins that are binary-weighed. Thus improved sensitivity can be achieved when measuring low level signals. Moreover, the output amplifier is bandwidth capable of demodulating the envelope of an RF modulated signal up to 75MHz. The detector incorporates temperature compensation circuitry, enabling repeatable and stable RF power measurements under varying environmental conditions. The LTC5564's speed and frequency capabilities open up a wide range of useful applications, including microwave communications, telemetry, radar detectors, RF power amplifier monitoring and fault detection, automatic level control, test instrumentation and cellular networks. The LTC5564 can be powered from a single 3.3V or 5V supply. Normal operation draws a nominal current of 44mA. The device is rated for operation from -40°C to 85°C. The LTC5564 is offered in a small 3mm x 3mm 16-pin QFN package. Pricing starts at $2.90 each in 1,000 piece quantities. For more information, visit http://www.linear.com/5564. Linear Technology Corporation, a member of the S&P 500, has been designing, manufacturing and marketing a broad line of high performance analog integrated circuits for major companies worldwide for three decades. The Company's products provide an essential bridge between our analog world and the digital electronics in communications, networking, industrial, automotive, computer, medical, instrumentation, consumer, and military and aerospace systems. Linear Technology produces power management, data conversion, signal conditioning, RF and interface ICs, and µModule® subsystems.